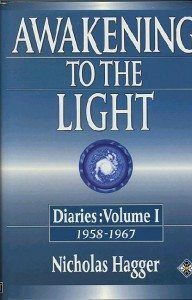 Awakening to the Light is volume 1 of Nicholas Hagger’s Diaries and covers the ten years from 1958 to 1967. As with A Mystic Way, it attempts to describe the author’s evolving vision of Reality and his discovery of himself as an artist, and can also be defined as a work of process philosophy. In the tradition of David Gascoyne’s Journal, 1937-1939 – Gascoyne spoke at the launch of Nicholas Hagger’s Selected Poems – and holding a similar fascination to Dorothy Wordsworth’s Journals or Franz Kafka’s Diaries in that they enable us to see the artist at work, Nicholas Hagger’s Awakening to the Light offers us an account of his progress towards his metaphysical vision of the universe. Nicholas Hagger has kept a daily Diary since 1963, and this volume covers his early years, including all his time in Japan and the Zen and Taoist influences in his work. It shows how his long poem ‘The Silence’ (which is as important in Nicholas Hagger’s poetry as ‘The Waste Land’ is in Eliot’s) grew over a year and a half, and records how his poem about the decline of Europe, ‘Old Man in a Circle’ came to be written. Reading Nicholas Hagger’s early Diaries offers many insights into the emergence of his metaphysical vision in the crucial formative years. These Diaries document the background to his early poetic works and short stories. He has led a full and varied life in both the West and the East, and his work reflects the pressure of real events that have shaped our Age. A metaphysical light shines through all of Nicholas Hagger’s writings, a unitive vision that confirms his status as one of our century’s most outstanding philosopher-poets. In Awakening to the Light we have a rare opportunity to see the artist at work. This first volume of diaries offers us a unique account of Nicholas Hagger’s progress towards his metaphysical vision of the universe, and revealing insights into the events of his life which inform his poetry and philosophy. We read of his early years in Japan, when he was finding himself as a poet, and of the contact with Zen Buddhism and Taoism that preceded his first experience of illumination by the mystic Light. In the tradition of David Gascoyne’s Journal and Franz Kafka’s Diaries, these writings enable us to see the roots that underlie Nicholas Hagger’s creative process and his quest for the philosophy of Universalism. These first diaries should be read in conjunction with his major poems, ‘The Silence’, ‘Archangel’ and ‘Old Man in a Circle’; also his collected poems, A White Radiance, and his autobiography, A Mystic Way, both of which are published by Element. Nicholas Hagger’s autobiographical books present his quest for Reality and reflect the Age. They present a new approach to autobiography in emphasising inner transformation and the vision of unity.